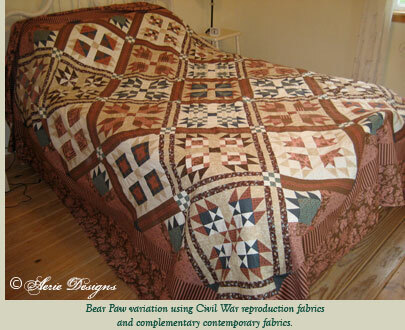 Aerie Designs provides custom quilt and graphic design, as well as quilting and sewing instruction. It was founded by Andrae Lowery in 2006 in Western Pennsylvania, and relocated to South Jersey in 2012 when Andrae married Tim DeHaan and moved to South Jersey. 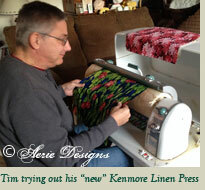 Tim and Andrae enjoy the creative process, whether it's with fabric, wood, food, or a wide variety of other mediums. They now make their home in Elkin, North Carolina, where they are active in their church and quilt guild. The DeHaans have four grown sons between them, each serving or having served in the armed forces, with 30+ combined years of service. 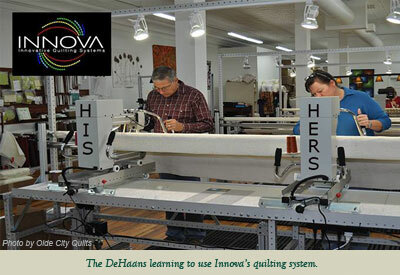 Every project the DeHaans are involved in receives their special care and attention. Andrae began sewing as a little tyke, as soon as her grandmother felt she could handle a needle. Her grandmother had her sewing “clothes” for her dolls, then advanced to helping with quilts and other projects she was working on. The summer after second grade, they walked to the town fabric store and selected fabric for Andrae to make a matching skirt and vest combination, complete with coordinating blouse. Andrae’s failure to completely read the layout instructions resulted in her grandmother educating her on how to turn a mistake into a “happy accident”. While in high school, Andrae worked for a national fabric store assisting customers with fabric selection and cutting fabric. She seemed to bring home more fabric than paycheck and her father often teased her that she’d rather make a new outfit than do laundry. During her senior year, she decided to make a quilt. Being a Texas girl, it was king size! Each and every piece was painstakingly measured with a yardstick, marked with a #2 pencil, and cut with her prized 8” Gingher dressmaker shears. The 4” blocks were sewn together block by block and threads snipped between each block — the way garments are often sewn. It wasn’t until many years later that Andrae discovered chain piecing, and hasn’t snipped between pieces! Andrae picked up quilting again in the late 1990’s while living in Utah. Her quilting tools advanced to rotary cutters, acrylic rulers, and cutting mats, along with a variety of marking tools and a ¼” foot for her machine. While living in the Pittsburgh area, she started teaching at a local quilt shop and encountered her first long arm quilting machine. The youngest of four children, Tim expressed his artistic creativity a variety of ways throughout his life. From working with oils and water colors, stained glass, and photography in high school to macramé, mod podge and other creative arts while assisting with the management of a national art supply store, to designing and drafting HVAC systems for his father’s customers. Tim has also worked in floral design and computer systems. He built custom barns and worked as a finish carpenter doing kitchen, bath, and boat interior remodels. The many complex cognitive functions required in quilting has been wonderful therapy for Tim after experiencing two brain injuries in 26 months. We were told that brain injury patients often find that their pre-injury deficits are amplified post-injury. Tim is fortunate in that his strengths have also been amplified. He has always been mathematically adept — the math required in calculating yardages and cutting diagrams stimulates that critical thinking aspect of the brain, as does the geometry employed. When Tim and Andrae were dating, Tim promised Andrae a long arm machine — he barely knew what one was, let alone their cost, but thought it was a great tool for Andrae to use in her quilting. They attended their first quilt show together shortly after they were married. After Andrae showed off her free motion “skills” on one of the machines there, Tim took over and started “doodling”. 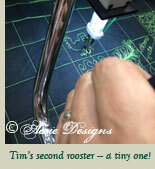 Next thing Andrae knew, Tim had stitched out an upside down rooster — freehand! This was his first time touching a long arm machine! He answered Andrae’s look of surprise with, “I’m going to get you one of these machines, but I’m going to be better at it than you are!” That was the beginning of Tim being bit by the quilting bug, and he’s jumped right in with both feet. The DeHaans have a smooth working relationship, with Andrae doing most of the design, piecing, and finishing, and Tim handling most of the quilting. Tim has a great eye for laying out blocks, especially when the intent is to be “scrappy”, so Andrae willingly allows him that pleasure. Contact us today to reserve your space on our schedule. Thanks for reading this far! As a "reward", we wanted to share a bit of our family-friendly entertainment! We've shared with you about Miss Kitty adopting us in 2012 — the following is a video showing her deciding to become part of the family. Andrae was working on the gear stick of her little Saturn when Miss Kitty introduced herself. Enjoy! Meet George and Molly, the DeHaan's quilting sidekicks! They like to travel with the DeHaans, especially if fabric acquisition is in order! George and Molly can often be found participating in a variety of shenanigans. Tim has always loved monkeys! When the DeHaans found Curious George at Kohl's, they left with three! One for each of the two grand girls, and one for Tim! 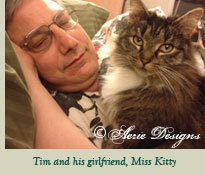 Tim's George is sweet on Molly, and often lays claim on Andrae, but Tim quickly sets him straight! In addition to his job as "quilting helper", George has the responsibility of caring for Tim throughout all hospital stays. He's got quite the collection of hospital ID bracelets! Andrae loves cows, and has quite the collection! 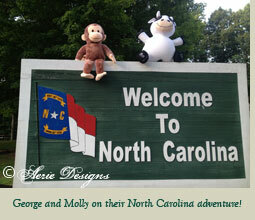 Molly joined Andrae back in Pittsburgh, and was the first of her cows to move to New Jersey. She's fond of bright floral fabrics, and especially fabrics with cows on them!